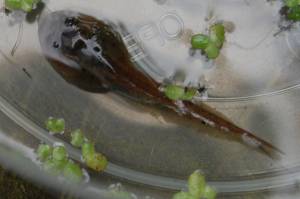 Observation - Tadpole - UK and Ireland. Description: Large tadpole, grey. We think this is very late for a tadpole! It may overwinter before becoming a frog. Large tadpole, grey. We think this is very late for a tadpole! It may overwinter before becoming a frog.